Tesla plans to make at least 21,000 Model S sedans at its Fremont, Calif., plant this year, and double that output in 2014. (Bloomberg) -- Tesla Motors Inc. CEO Elon Musk said the electric-car maker intends to add factories in Europe and Asia, anticipating volume gains from a planned mass-market battery car. The company this year plans to make at least 21,000 of its $70,000 Model S premium sedans at its Fremont, Calif., plant, and double that in 2014. While the factory has capacity to produce as many as 500,000 vehicles a year, the addition of a smaller electric car priced about half that of Model S will require additional plants, Musk said. "We'll try to locate those close to where people are, close to where the customers are, to minimize the logistics costs of getting the car to them," the Tesla co-founder said in an interview with Bloomberg Television. 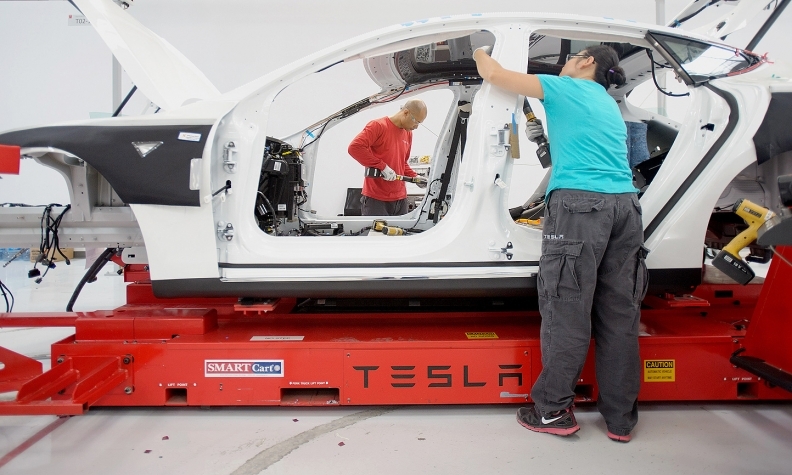 "I think long term you can see Tesla establishing factories in Europe, in other parts of the U.S. and in Asia." Tesla, named for inventor Nikola Tesla, has been an automotive phenomenon this year, with its shares surging more than fourfold and its market value exceeding some established carmakers such as Fiat S.p.A., the majority owner of Chrysler Group. The Palo Alto, Calif., company reported its first profitable quarters this year, excluding some items, and has seen demand for the Model S outstrip its ability to build the car. Among the company's accolades, Model S was named 2013 "Car of the Year" by Motor Trend magazine; Consumer Reports in a May review rated it among the best it's ever tested; and this week Tesla said it received top crash and safety ratings in tests by the National Highway Traffic Safety Administration. Musk provided no details on how much or when Tesla would invest in more factories. The company has opened a small facility in Tilburg, Netherlands, where it's assembling Model S components shipped from California to Europe, for cars it has begun selling there. While Tesla's next vehicle, the Model X electric SUV, goes into production at Fremont late next year, the timing of the smaller, lower-priced vehicle, isn't firm. "Certainly, within five years we'll have our mass-market electric car available," Musk told Bloomberg. "We'll start seeing hundreds of thousands of electric cars going to market every year." Musk, in previous interviews, has said the lower-priced car would arrive in about three or four years. The company this month filed an application with the U.S. Patent and Trademark office to use the name Model E for an automobile. Shanna Hendriks, a Tesla spokeswoman, declined to comment on whether that's intended for the still-unnamed mass-market electric car. The trademark filing was reported Tuesday by the website VentureBeat. In an interview at the Fremont factory last month, Musk said building another plant in California would be challenging, owing to the state's high costs. The Fremont factory was opened in the 1960s by the predecessor of General Motors. It became a joint-venture plant for GM and Toyota Motor Corp. in 1984 and was acquired by Tesla in 2010. "The real tough question is, beyond this plant, would we establish another plant in California?" Musk said in the July interview. "That's where it gets really tricky. What I can say is we do want to ultimately bring this plant to its original production capacity of half a million vehicles a year."